AJO, Ariz. (CNS) — In the Sonoran Desert northeast of Ajo, temperatures can soar to mid-90s in late spring and above 100 degrees in the summer. “Only God knows what was going on here, but we know someone was using the water,” one of the Samaritans said. Although hot and tired, everyone seemed pleased to see empty water containers. 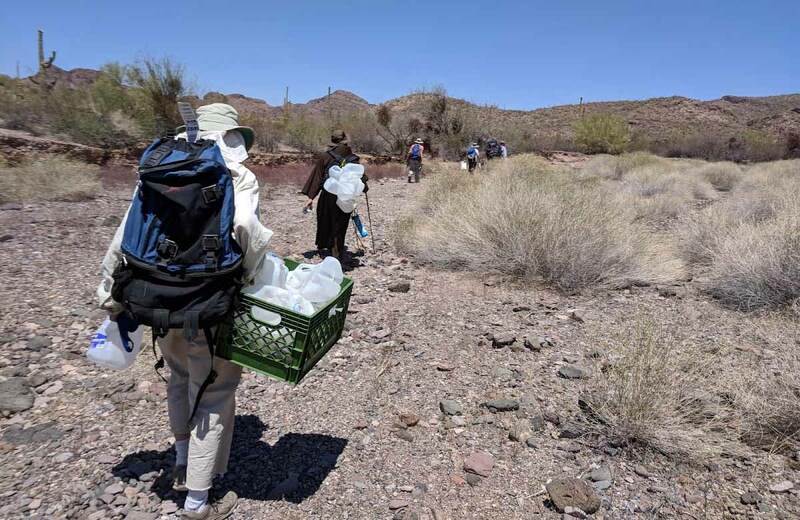 After six hours in the desert, the group packed up the trash and empties and started walking back to the vehicles. It was a “good” day, said Sister Bourg, wearing a “humanitarian aid is never a crime” T-shirt. The most common cause of death for 55 percent of the migrants whose remains are recovered is hyperthermia, hypothermia or heat stroke, Araibi said. For the rest, the cause is “undetermined” because of the condition of the remains. Sister Bourg spent 11 years in Guatemala where she witnessed the pain and suffering of people who struggled to feed and clothe their children. “Although they were poor, they welcomed me.” It was this generosity that moved her to the work of hospitality for migrants. Upon her return to the U.S. in 1997, she worked at a clinic in Texas for migrants and unaccompanied children from Central America. In 2010, four sisters from her congregation opened a new community in Douglas, Arizona. Their main ministry is to work with deported adult migrants at a humanitarian aid center just inside Mexico’s border in Agua Prieta. She said her “most joyful experiences” are when she sees that water containers left weeks earlier have been used. Another “special poignant memory,” she said, is when she found the words “muchas gracias” carved into the dirt in large letters. Tran is assistant director of the Redemptorist Renewal Center in Tucson, Arizona.